These Mighty Minnow's are made with a glow and UV body with hand painted eye's and color. The blade's are a painted #0 Colorado. 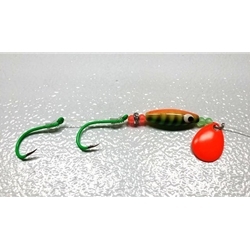 Tied with colored #4 Gamakatsu Octopus hook's or #4 Matzauo Sickle hook's, 4mm glow bead's and 12lb Maxima Ultragreen line.